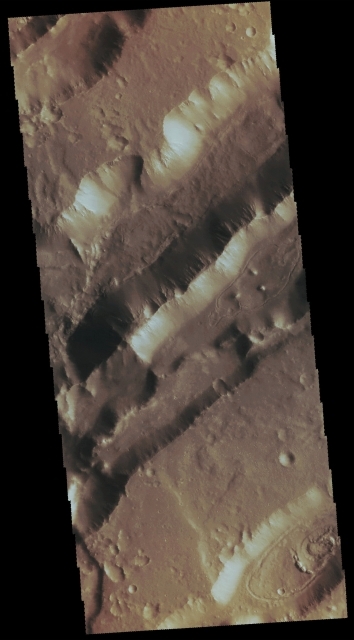 In this really fascinating VIS Contextual Image (or "CTX" frame), taken by the NASA - Mars Odyssey Orbiter on March, 15th, 2016, and during its 63.224th orbit around the Red Planet, we can see a few semi-parallel sets of Surface Depressions. These Depressions, according to Planetary Scinetists, are (---> should be) Tectonic Graben that formed when a Block of Material is down-dropped between Paired Faults. Nilokeras Fossa is located on the Margin of the Martian Region known as Kasei Valles. On the lower Eastern Corner (Dx) of the picture, you may already be able to see an extremely interesting and quite unusually-looking Surface Feature which seems to be NOT truly Natural. Of course we, as IPF, are just (and heavily) speculating, but tomorrow's EDM will however be dedicated to such a Feature, as well as to all the Planetary Researchers whose main goal is to look for and, possibly, find, some of the so-called "Anomalies" which are located on the Surface of Mars and other Celestial Bodies. This picture (which is an Original Mars Odyssey Orbiter b/w and Map Projected frame published on the NASA - Planetary Photojournal with the ID n. PIA 20619) has been additionally processed, magnified to aid the visibility of the details, extra-contrast enhanced and sharpened, Gamma corrected and then colorized in Absolute Natural Colors (such as the colors that a normal human eye would actually perceive if someone were onboard the NASA - Mars Odyssey Orbiter and then looked down, towards the Surface of Mars), by using an original technique created - and, in time, dramatically improved - by the Lunar Explorer Italia Team.